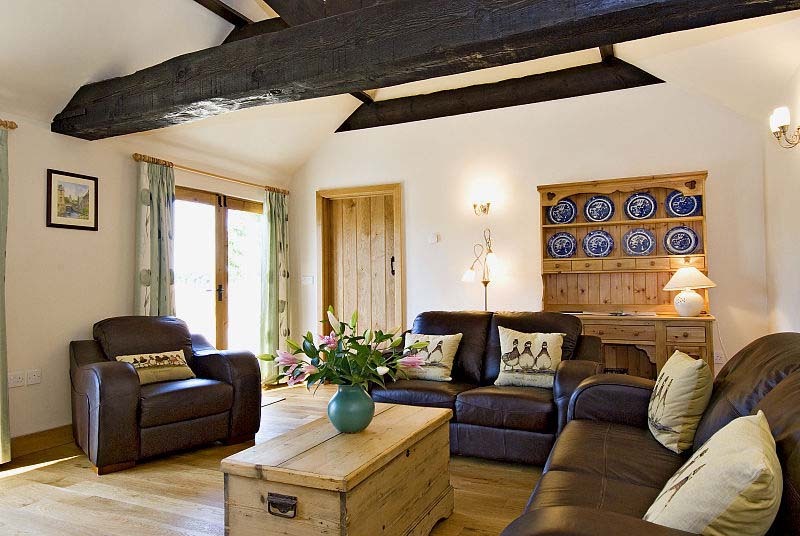 The cottage is self-catering and sleeps up to 4 adults in two bedrooms. The double bedroom (#2 in the plan below) has an en-suite bathroom and the twin bedroom (#1 in the plan) has an en-suite shower room. 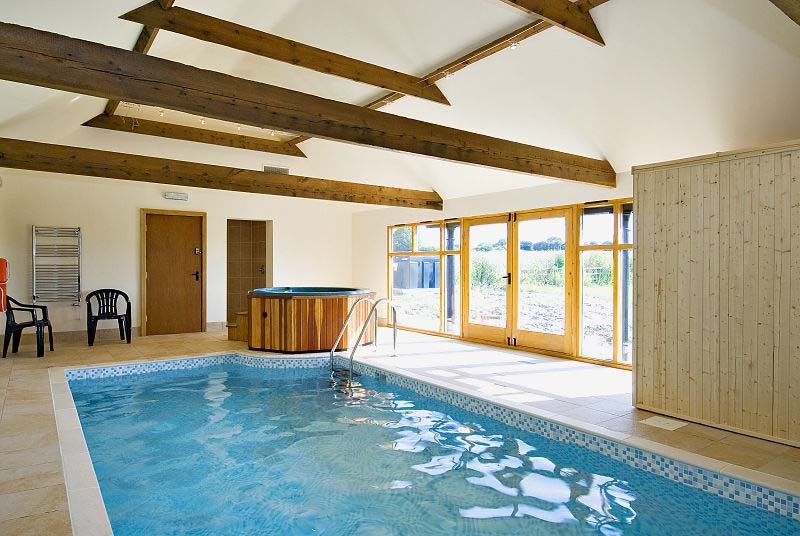 It has a private indoor heated swimming pool, sauna and hot tub - all for guests' sole use. There is ample parking by the front door inside the enclosed courtyard for 2 to 3 cars. For cooler days it has comfortable underfloor heating throughout together with a wood burning stove in the lounge (an initial supply of logs is provided for the stove). The cottage is strictly non smoking including the surrounding grounds. The cottage is self-catering and sleeps up to 4 adults in two bedrooms. The double bedroom has an en-suite bathroom and the twin bedroom has an en-suite shower room. The cottage is in a rural setting with views of woodland and farmland. Nearby are numerous bridleways, green lanes and footpaths. It has a well equipped kitchen fitted with 4 ring gas hob, electric oven and grill, iron, ironing board, washer, tumble dryer, dishwasher, microwave, toaster and fridge / freezer. All linen, duvets & towels are provided. This includes kitchen, hand, bath and pool towels. DVD player with a selection of discs. Excellent walks starting from the front door. Private walled courtyard with BBQ (an initial supply of charcoal is provided). A welcome pack is provided. Prices are fully inclusive of all the facilities described above. The cottage is in a rural setting with very limited public transport and thus for most people a car is essential to access the the cottage. Sorry because of the style of the facilities (swimming pool, hot tub etc) no pets are allowed. The bookings are restricted to guests who are at least 18 years old and at least one must be over 25.